When I got the idea for my blog, I had no clue how to set up a website. I knew “the look” I wanted, so I hired a graphic designer to create a one-of-a-kind design for me. It took me months to find a designer who was in my budget and yet, who's work I loved. When I finally found one that met my criteria, I submitted my project details and jumped in head first. What a mistake. I had never worked with a graphic designer before and knew nothing about how the design process worked. Sadly for me, it was a costly lesson. My first mistake was, I signed a contract that only protected the designer, there was nothing in the contract that protected me from sloppy or incomplete work. My second mistake was, I paid for the project in full before the work was complete. After months of waiting for the designer to complete the work (it was supposed to be finished in 6-8 weeks), she stopped communicating with me completely and left with an incomplete blog. In the end, I had to pay a web programmer to fix what she had left undone. Whether you're a small business owner or blogger, there will come a time when you will need to work with a graphic designer or web programmer. And when you do, be sure to consider these elements when choosing who to work with. By taking your time and doing some extensive research, you can help to establish a positive working relationship, which will save you time, money, and stress! You may need help creating a custom logo design, graphics for your blog, or a template for your weekly e-newsletter. Some bloggers might need more extensive work, like a complete website redesign or help to create a complete brand for your business. Have a strong idea of what you need before you go in. This will help save you from “up-sales” or services you don’t really need or can’t afford. Prices can vary from $200 for a simple logo redesign up to tens of thousands of dollars for a branding overhaul. For most bloggers, freelance graphic designers providing basic services will run between $25-50/hour on the low end and $75-150 for more extensive services from experienced providers. Any web designer you’re considering should be able to offer you samples of their work and style. While you want a style that’s unique to your brand, you also want to find a designer whose look and experience meets your needs. When you’re viewing a designer’s portfolio, take notes about the design elements that strike you most. Which particular designs stand out? Does the designer’s overall style feel like a match? Once you find a graphic designer whose style you like and who seems to fit your needs, check out their website for contact information (phone and email address), testimonials, rates, experience, and qualifications. It’s also important to perform a Better Business Bureau check and Google search on their company to see if they have any negative ratings or reviews. If a designer doesn’t offer testimonials on their website, don’t be afraid to ask for some references you could speak with. When you do, follow the same guidelines you’d use when checking out a potential employee. Ask about their flexibility, reliability, and how willing they were to work with a client to get the desired outcome. Get feedback from some of their previous clients and note any negative comments. As you continue to investigate a graphic designer, email them to see how quickly they respond to your inquiry. If it takes them more than 48 hours to respond, this could be a sign of how they’ll answer to correspondence in the future. With a potential new client, designers should be quite responsive. Typically they should get back to you within 24 hours or less during the workweek. Even if it’s just a simple, “Thank you for your inquiry. Let me look into that and get back to you shortly,” it’s better than letting a client (or potential client) email slip into the void. Be sure any contract you sign protects both the designer and you! The AIGA (American Institute of Graphic Artists) offers an in-depth sample contract for design services. Reviewing the contract will give you guidelines to look for in your own contract, even if you use something less extensive for your work. A professional graphic designer should have a standard contract, and the language should outline their side of the agreement as well as yours. Even if each graphic designer has their own contract, don’t hesitate to ask for clarification or revisions to fit your unique situation. Your designer may be handling proprietary information for your blog, so it’s important they offer some copyright protection for design work they do with your business (so your unused logo or graphics don’t end up on someone else’s site). While a graphic designer will likely include terms and conditions that protect them, you’ll also need to protect yourself. The contract should clearly outline their end of the bargain—specific and time-bound deliverables, revisions, and how future work will be handled. Be sure the contract outlines which party will insert the content and what format it should be delivered in (lest you end up with low-resolution graphics or only .ai files you can’t extract and use on your blog). This protects both of you from later misunderstandings. Be sure to get everything in writing! I’ve heard of so many people paying up front for services, only to be left with a half-finished project. Don’t let this happen to you! Agree to pay half up front and the other half when the project is complete. If a designer insists on full payment up front, consider working with someone else. If you’re looking for a site design, it’s best to tell your designer exactly what you want, including how wide you’d like the text area, how many navigational tabs you’d like, what type, color and size of font you want to use, if you want a newsletter function, an RSS feed, or shopping cart. For help picking out a color palate for your website or blog, check out COLOURlovers. It’s a fantastic resource offering tons of different color palates, colors, and patterns. Another great resource is Dafont.com, as they offer over 8,000 different fonts to choose from and most of them are free. If you’ve used a Pinterest board or if you have a design board, share it with your designer so they can get a feel for the look and aesthetic you’re trying to achieve with your blog or website. While you want your site to be unique to you, it’s also helpful to show examples of other blogs you like—and don’t like. Specifically point out which brand elements and features you think work well, as well as fonts, colors, or other elements you don’t like. Explain why for each. 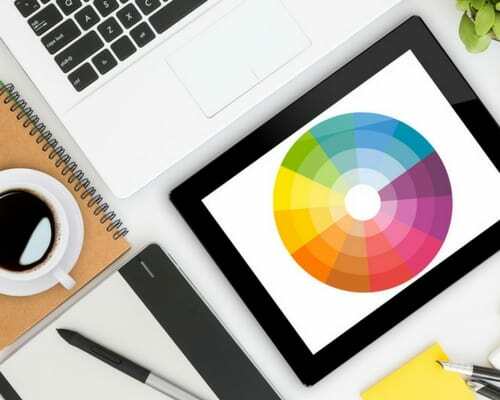 When working with your graphic designer, especially on an extensive site design, like a website setup or redesign, you should use your brand to guide you. Your brand is the overall look and feel of your site, your materials, and all of the content you produce. Your designer should understand this and be eager to help you extract a consistent and clear message. Provide any reader personas or avatars you’ve developed, as well as your own online persona. Your designer should have an understanding of who your audience is, who you are, and the message you hope to convey. The more information you share, the more your input helps your graphic designer create a design you’ll love. By keeping the lines of communication open and clear, you can more easily establish a happy working relationship with your graphic designer. 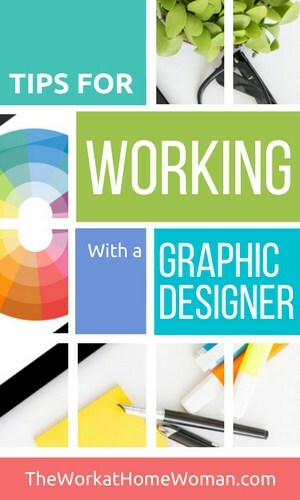 What tips do you have for working with a graphic designer? Have you had a positive or negative experience? Are you a graphic designer? What tips do you have to make the design process easier? Share it with us in the comments! Post originally published April 2, 2009. I am glad you said that any designer can offer you samples of their work before you hire them. I am looking for a graphic designer for some T-shirts I have been working on. Thank you for the tips on working with a graphic designer. Glad you enjoyed the tips, Sutton! Holly, great info to share! As a graphic designer myself, it is extremely helpful when my clients have a good sense of their likes / dislikes and can share that with you. I also want to caution your readers to the old adage that you “get what you pay for!” So please do not be sticker shocked – having a consistent and professional image is worth the investment.